Now you can enjoy Karaoke with MP3s from your own device; turn them into Karaoke tracks in real time with SingPlay! Sing and create your own unique recordings with your favorite songs and share them with your friends, family and the world. It’s so easy to get started. There’s no need to download any special tracks or stream music from YouTube. SingPlay automatically converts the music on your smartphone into Karaoke tracks while reserving the original quality of the music; there are no MIDI sounds or cover versions with this app! Browse through your music, pick the track you like and start singing. If you want to document your performance, just press the record button. 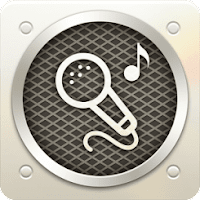 Create your track in either Original or Karaoke Mode; Original Mode retains the original vocal while Karaoke Mode features only the instrumental version of the track. Once you’ve finished your performance, listen to your recording and make edits to your sound with SingPlay’s volume and voice controls. If you’re happy with your creation, share it on Facebook, YouTube, and Google+, or save it as an MP3 file on your device. Download SingPlay today and get started! Smartphones with Android 4.1 (Jelly Bean) or above (including 4.4 KitKat). Tablets will be supported in the near future. * Please use either earbuds or headphones for the best recording experience. The microphone within the device will provide a better quality recording, so it is generally recommended to use earbuds or headphones without a microphone. Your feedback is welcome and highly appreciated! Thank you!